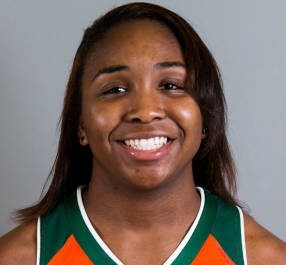 Jessica Thomas will lead the Hurricanes from the point guard position this year. The 5-foot-6 junior has put up two very successful seasons for the Canes as a freshman and sophomore, and she will look to build upon that momentum heading into this season. Thomas is a prototypical point guard whose primary strength on offense is facilitating for others. 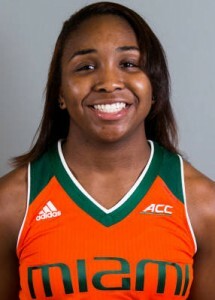 She led the Hurricanes with 74 total assists last year and is the team’s primary ball handler. Thomas will also look for continued improvement from beyond the three-point line. As a freshman she shot 27 percent from the field, and last year she upped that to 29 percent while leading the team in three-pointers made with 45 on the season. With continued improvement, the junior could find herself averaging double figures in the scoring column this year, as she came close (9.3 points per game) last season. Head Coach Katie Meier likes the way her point guard is playing with the season just a few weeks away. “Right now, I think Jessica Thomas is playing at the highest level. She’s got a great motor, a great passion that just burns inside of her,” Meier said on Tuesday. Thomas doesn’t only excel on the offensive end of the court. She plays relentless defense and the numbers show it. She has 61 total steals in her career and averaged 1.2 per game last year. Many would assume that her height would be a disadvantage on the basketball court, but it is quite the opposite. As a smaller guard, Thomas can get underneath opposing players and wreak havoc on the defensive end of the court. With all this said, perhaps Thomas’s greatest strength lies in her durability. During her freshman campaign, she averaged 17 minutes per game and played in all 31 of the Canes’ contests. During her sophomore year she was thrown into the starting lineup and saw increased minutes. She was second on the team averaging 26.3 minutes per game. However, the extra run didn’t wear her down at all, as she started 32 out of 33 games for the Canes last season. Thomas will likely be a major piece to the puzzle on a team that made the NCAA Tournament last year. When the Canes take the court this season, look for even more improvement from Thomas. Many of the team’s aspirations will hinge on how well their floor general plays, which is a good sign for the Canes this season.